My second ground of 2016 was on Saturday 23rd January at Bashley Road in Bashley, Hampshire. 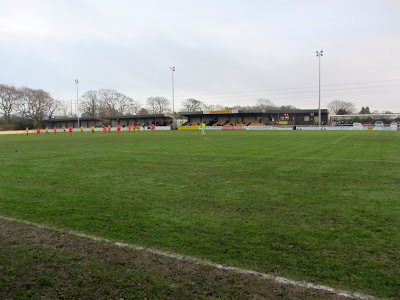 The match was Bashley vs. Banbury United in the Southern League Division One South & West. Bashley Road is in the village of Bashley close to the northern edge of the nearby town of New Milton. The ground is sits adjacent to a caravan park to the east, a cricket club to the west, a garden centre to the south and fields to the north. 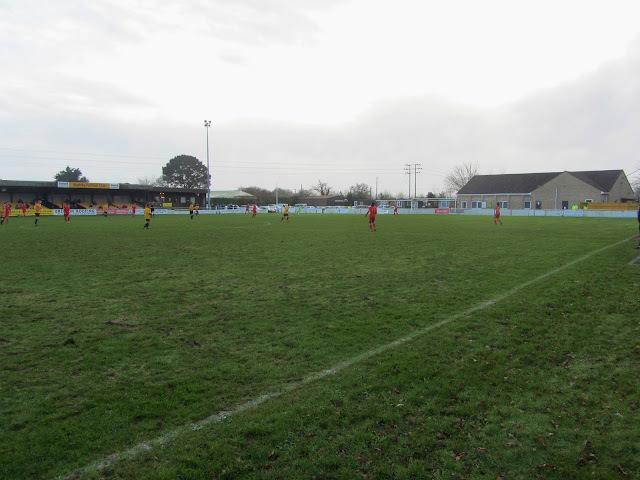 The venue is just over a mile north of New Milton railway station and has been home to the club since they formed in 1947. 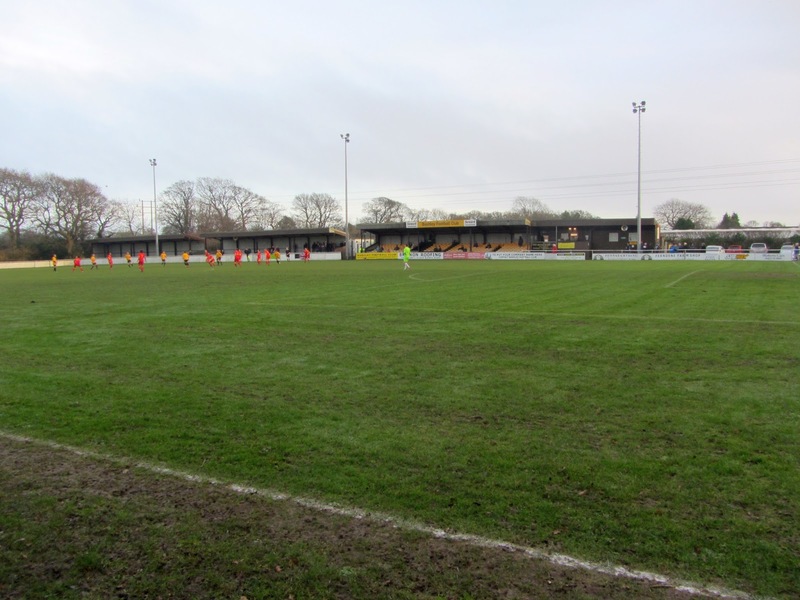 Covered spectator areas make up almost all of the southern side of Bashley Road. These areas consist of two metal terraces towards the eastern end of the ground and a 300-seat structure including a specified section for officials. Attached to this seated area is a club building which includes a club shop, office and media area with a balcony extending out from this. The northern side of the ground consists of two levels of concrete standing with dugouts built into lower level either side of the half-way line. The remainder of the venue is uncovered hard standing. At the eastern end there is a large grass area behind the hard standing while at the western end there are a couple of buildings. One of these is a clubhouse and food outlet while the other is Bashley Village Hall. The north-west area is a small car park for players and officials with the club using another site down the road for spectator parking. Bashley went into the game having lost all 22 league matches they had played in the season to this point so Banbury were fully expecting to head home with the three points. The visitors took the lead early on as ball over the top led to Bashley goalkeeper Kieran Greene bringing down Ricky Johnson in the box. Johnson picked himself up and dispatched the penalty to give his side an 8th minute lead. Banbury were given another opportunity from the spot in the 31st minute when a defensive error by Bashley saw Dan Maher allowed to go clean through only to be felled by defender Aaron Dunne. As Dunne was the last man he received his marching orders. Johnson again stepped up and again went the same way but this time Greene was equal to it and saved the spot kick. Just before the interval the travelling side did notch up a second when a cross from the right-wing by Callum White was steered in by George Nash. The early stages of the second half were quiet as 10-man Bashley frustrated Banbury. 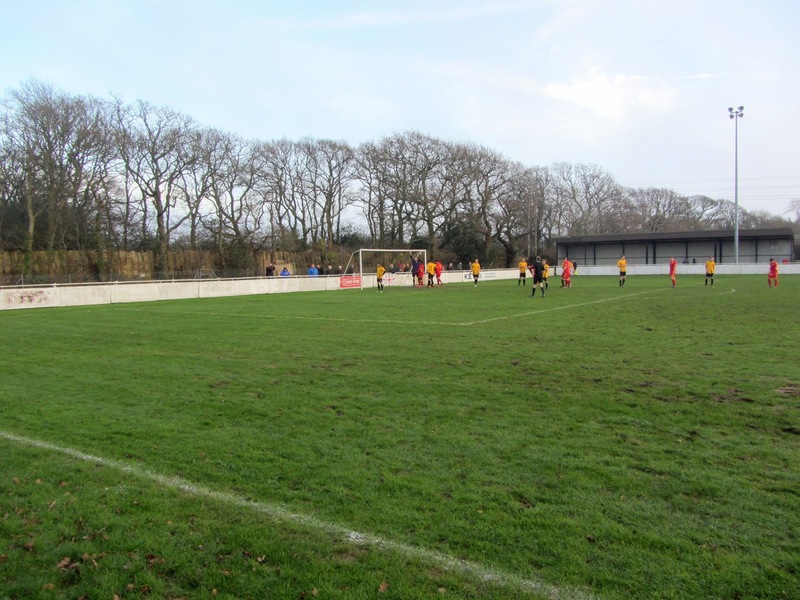 This continued until the 67th minute when Bashley conceded their third penalty of the match after a trip in the area. This time the spot kick responsibility fell to Mark Bell who drove the ball into the bottom corner. This goal knocked the stuffing out of Bashey and they let in two more goals in quick succession. In the 73rd minute a cross into the box was headed on to Darius Browne who struck past Greene and in the 77th minute a defence-splitting ball allowed Leam Howards to stroke the ball past the advancing keeper to make it 5-0. 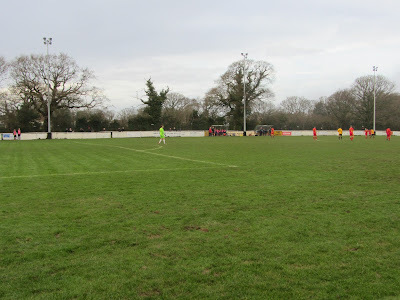 Banbury had a number of efforts in the final minutes and Howards was denied his second of the game when an excellent chip was ruled out for offside. The final whistle went with Banbury recording a 5 goal victory but it was still a determined display by Bashley given they played the bulk of the game one man down. Cheers - mixed the two keepers up in the match report. Have now corrected.